During the ribbon cutting for the new Marc Basnight Bridge April 2, crews were already hard at work removing spans of the old Bonner Bridge in a demolition project scheduled to be completed by late 2019 or early 2020. The the pieces are being removed by cranes, then hauled through Oregon Inlet by barge to bolster artificial reef sites nearby. Currently, the barges cannot get through the old Bonner Bridge at the main span due to shoaling, But the ocean bar is passable for the barges to head offshore. 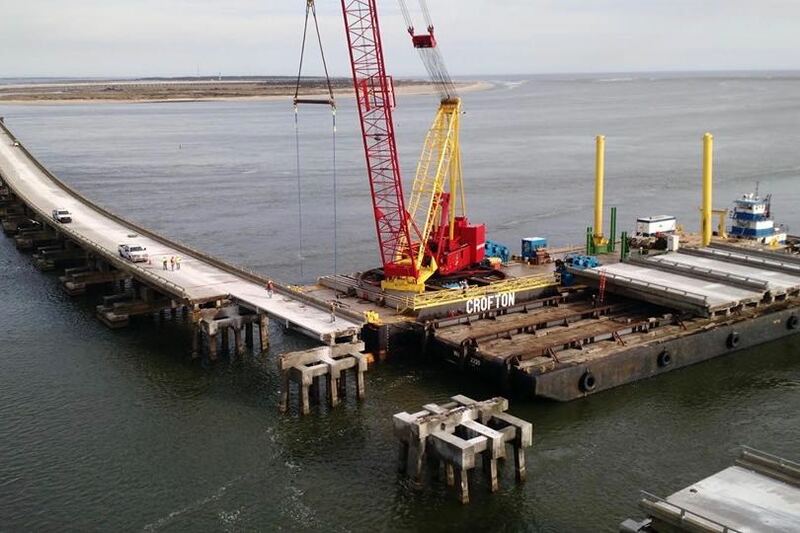 As of Friday, April 5, the decking had already been removed from three spans, toward the southern end of the bridge, according NCDOT Public Relations Officer Tim Haas. 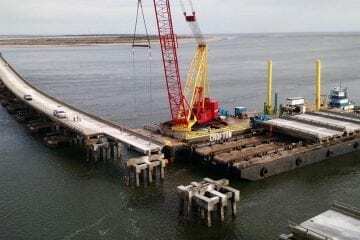 The next step is to remove the caps and pilings., which will create an opening in the old Bonner Bridge at deeper water, away from the shoaling in Oregon Inlet, and allow the barges to move from either side of the bridges to collect material. Once the three-span section is fully removed, demolition will shift as far north as the water depths and shoaling allow. Deck and piling removal will continue , with two crane barges working from north to south — one removing the decking and the other, the caps and pilings. Work on the current spans could be completed in the next 30 days, while the other marine-based demolition operations will take place over the next eight to 10 months. “At this time, the target for completing the demolition is end of 2019 or early 2020,” said Haas. Not all of the Bonner Bridge will disappear from the landscape. 1,000 feet of the bridge on the southern end, (will remain standing to serve as a fishing pier and a pedestrian walkway. This stretch of the old bridge will also retain the “Bonner” name. The existing pedestrian bridge at the old Bonner Bridge is closed to the public as the demolition project progresses. Wish there was a live camera or webcam feed from the bridge being dismantled. That would be so interesting to watch. You sound like the Busch commercial,”you’re kidding me, right”.